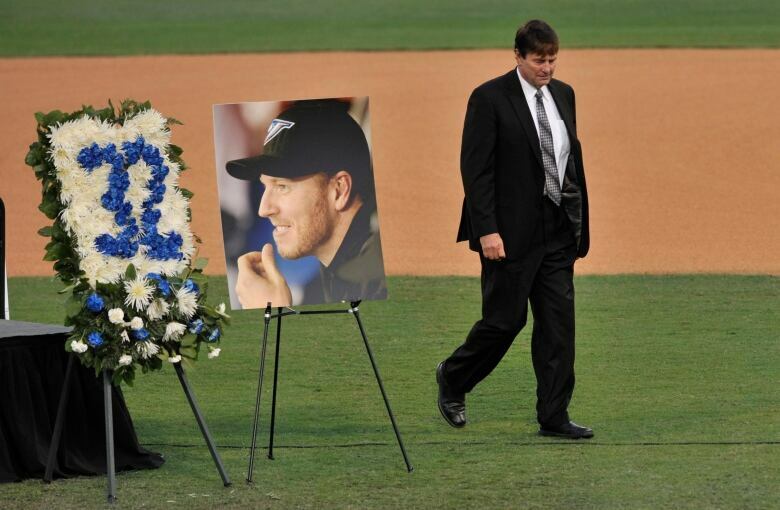 Former star pitcher Roy Halladay, who was the face of the Toronto Blue Jays for about a decade, was remembered as someone dedicated not just to his sport, but to his family and friends at a memorial in Clearwater, Fla., on Tuesday. Toronto Blue Jays pitching great Roy Halladay was remembered Tuesday as an amazing husband, father, friend and teammate who was one of the best pitchers of his generation but an even better man. A 91-minute "Celebration of Life for Roy Halladay" attracted more than 1,000 people to Spectrum Field, the spring training home of the Philadelphia Phillies, one of two franchises the two-time Cy Young Award winner played for during a stellar 16-year career. "The man made the ballplayer," Phillies owner John Middleton said, "not the other way around,"
Halladay died Nov. 7 at age 40 when the private plane he was piloting crashed into the Gulf of Mexico off the coast of Florida. The eight-time All-Star who pitched a perfect game and a playoff no-hitter, Halladay played for the Blue Jays from 1998-2009 and for the Phillies from 2009-13, going 203-105 with a 3.38 ERA. The public memorial began with a video tribute and ended with Halladay's wife, Brandy, and sons, Braden and Ryan, standing on the mound and releasing butterflies from a container in a final "goodbye." 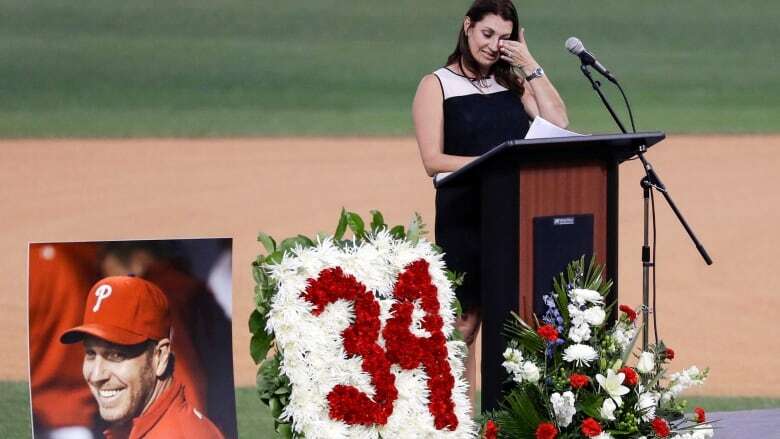 "All eyes are on me," the pitcher's wife, the last of nine speakers, said from a rostrum perched behind the mound, flanked by pictures of Halladay with the Phillies and Blue Jays, along with floral arrangements bearing the 34 and 32 jersey numbers he wore. "I'm really fortunate that I've gotten used to that feeling. I've literally been standing next to a man for 21 years that people could not take their eyes off of," she said. "He was awe-striking. He was beautiful inside and out. Without saying a word, he seemed to always have just the right thing to say. When he did speak, people listened." Other speakers included Halladay's dad, Roy Jr., former teammates Cole Hamels, Chase Utley and Chris Carpenter, long-time baseball executive and former Blue Jays GM JP Ricciardi, ex-Phillies manager Charlie Manuel and Blue Jays trainer George Poulis. Hall of Famer Frank Thomas, former Blue Jays manager Cito Gaston, Rays manager Kevin Cash, and one-time teammates Cliff Lee, Jimmy Rollins, Ryan Howard, Jose Bautista, BJ Ryan, A.J. Burnett and J.A. Happ were among other guests. "He didn't like to lose, so everything he did, he did to win. But there was a joy to it. I'll always remember that," Rollins said. "He made you better. That's what he did. Everywhere you went, he made everything better." Carpenter grew up with Halladay in the Blue Jays organization; Hamels valued the 6-foot-6 right-hander as a friend, teammate and mentor; and Utley lauded the pitcher's relentless work ethic as a player. "I saw everyday what it took to be a man among boys," Utley said. Carpenter told a story about going swimming in the Amazon River when he and Halladay took a trip to Brazil after the close friends faced each other in the decisive Game 5 of an NL Division Series between Philadelphia and St. Louis in 2011. Carpenter won 1-0. "He was never afraid of a challenge or doing something others might not want to do — or dare to do," Carpenter said. Brandy Halladay cried throughout her 17-minute tribute, remembering her husband as a family man who loved his two sons. Former teammates echoed those sentiments, insisting that as great a pitcher as Halladay was, they were more impressed by the man off the field. "He tried to be the best that he could be. Full of passion and desire," former major leaguer Raul Ibanez said. "He was not a one-dimensional man. Who he was, everything about him was just great and grace. He carried himself with class and confidence and humility. Just a tremendous human being."